Thoroughbred racing in Canada during the first half of the twentieth century was a parochial, haphazard, but rather colourful enterprise. The tracks and facilities were rundown and not up to a good standard. The sport was marred by short tracks and short tempered owners. There was very little investment by the turf elite for top bloodstock, nor for better facilities. Thoroughbred racing in Canada needed a messiah. There were a few good horses such as Inferno, Shepperton, Belle Mahone, and Kingarvie, who had crossed the border to race in the U.S. with some success. However the most popular champion of the first half of the century was undoubtedly Bunty Lawless. He was named as the best horse of the first fifty years in the twentieth century. He would be the equine messiah needed. Bunty Lawless was well bred for a Canadian back in the day, as he was by the imported American stallion Ladder. Ladder was a grandson of the renowned Fair Play, the sire of the immortal Man O’ War. Bunty Lawless was out of Mintwina, a stakes placed daughter of Mint Briar, who in turn was a grandson of Spearmint. Bunty Lawless was inbred 4×4 to the great sire Commando by Domino. Bunty Lawless won the 1938 Queen’s Plate over the good filly Mona Bell, thus establishing an exciting rivalry between them. These two faced each other in some of the biggest races in Canada for the next two seasons. Bunty Lawless was bred and owned by the popular racing patron Willie Morrissey, while Mona Bell raced for the Cosgrave Stable owned by a then new racing patron, one Edward Plunkett Taylor. The latter became the human messiah Canadian racing needed. E.P. Taylor would go on to remodel the Canadian racing landscape as the chairman of the Ontario Jockey Club, oversee the building of the fabulous new Woodbine Racetrack in 1956, and founded the world class Windfields Farm breeding empire. He also suffered a tragic loss when Mona Bell fatally broke a leg and could not be saved. There was a plan to breed Bunty Lawless to Mona Bell after the 1939 season. Taylor purchased a full sister to Mona Bell named Iribelle, who eventually became a foundation mare for the burgeoning breeding and racing endeavour Taylor was starting. He bred Iribelle to Windfields, a son of Bunty Lawless out of Nandi another Taylor foundation mare. Windfields was a fine stakes winner both in Canada and America, and he then became an important foundation sire to the Windfields Farm breeding legacy. In 1952, the result of the Windfields/Iribelle mating produced a daughter named Victoriana. She in turn gave the racing world major stakes winning champion Victoria Park as well as the lovely stakes winning filly Victoria Regina. Victoria Regina had three foals, all colts. Two of her colts were sired by Northern Dancer, in 1966 and 1967. The first was Viceregal, who became the Sovereign Award Canadian horse of the year as a two year old. The second foal was Vice Regent, who later became a thirteen time leading sire in Canada. Vice Regent is the sire of the 1981 Eclipse Award champion two year old colt and Sovereign Award Canadian horse of the year Deputy Minister. Deputy Minister was full of generational Canadian breeding. His dam was stakes placed Mint Copy by Bunty’s Fight, who is by, you guessed it, Bunty Lawless. This makes Deputy Minister inbred to Bunty Lawless 5×3. Deputy Minister was bred and owned by the small Centurion Farm of Mort and Marjoh Levy, who were enthusiastic owners on the Ontario racing scene. They acquired Mint Copy through the claiming ranks for $6,250. The Levy’s would send the strapping dark bay son of Mint Copy to trainer Bill Marko to learn his lessons to become a race horse. Marko had Deputy Minister ready early in his two year old season as the colt won his maiden race by a comfortable four lengths. His next start was in the Victoria Stakes where Deputy Minister broke a nineteen year old track record for five furlongs in 57 1/5. On to Belmont Park two weeks later, Deputy Minister drew away from his rivals impressively in the Youthful Stakes displaying his speed and class. After three dominating performances, the Levys where besieged with offers for their obviously talented two year old. They decided to sell a half interest in Deputy Minister to leading Canadian stable Kinghaven Farm. However one stipulation in the agreement was that Kinghaven’s trainer John Tammaro would take over the training. Tammaro prepared the colt to three more stakes wins in succession, the Clarendon Stakes, Colin Stakes and the Bull Page Stakes. As a side note, Marko became the trainer and part owner of the very popular and successful grey gelding Frost King. The much travelled Frost King was a four time Canadian champion, including a Horse of the Year Sovereign Award, and is a member of the Canadian Racing Hall of Fame. Tammaro brought Deputy Minister back to Belmont for the prestigious Champagne Stakes. The colt had missed some training due to a fever while in Chicago preparing for the Arlington-Washington Futurity, which he missed. Timely Writer handed Deputy Minister his first defeat in the Champagne as the big Canadian did not fire with his usual explosive speed. Deputy Minister then erased the doubter’s arguments by winning the Laurel Futurity two weeks later and then captured the Young America Stakes with a commanding three lengths victory. Both grade one races were at one and one sixteenth miles and he defeated the highly regarded Laser Light and Majesty’s Prince in both events. He won his Eclipse and Sovereign Awards following this eight for nine campaign. Deputy Minister was the co-highweight on the Experimental Free Handicap, along with Timely Writer, at 126 lbs. There were 32,450 foals born in 1979 and these two were considered as the best of all. The newly crowned champion was then sent to Kinghaven’s Florida facility for the winter, to get ready for the upcoming spring classic races as the winter book favourite for the Kentucky Derby. In January, Robert Brennan the owner of Due Process Stable offered a reported $6 million for a half interest in Deputy Minister. The offer was accepted. Centurion and Kinghaven retaining quarter interests each. Deputy Minister was now to run in the green and orange colours of Due Process Stable. The road to the Kentucky Derby can be fraught with disappointments which Deputy Minister and his connections were to experience first hand. The champion colt finished fifth to Aloma’s Ruler in the Bahamas Stakes and then second in an allowance race three weeks later at Hialeah. He had suffered an injury to his right fore leg along the way. The injury was serious enough to take him out of training and subsequently miss the American classic races. Participation in the Canadian classics was also abandoned while Deputy Minister recovered. It would not be until October when Deputy Minister came back to racing, reappearing in a six furlong allowance at Woodbine. He was full of run that day as he won by an easy six and one half lengths. Tammaro brought the colt back to New York for the Sport Page Handicap, but Deputy Minister re-injured his leg during the race and finished seventh. That was it for the year which started out so promising, but in the end became a strong reminder of how fleeting success can become in the Sport of Kings. Brennan was still very high on the talent of Deputy Minister and succeeded to buy out the remaining fifty percent interest of the big son of Vice Regent from Centurion and Kinghaven. Brennan then sent Deputy Minister to his private trainer Reynaldo Nobles for his four year old season. Nobles had Deputy Minister ready for the seven furlong Gulfstream Sprint Championship Stakes and the former champ did not disappoint. He charged from last to first in the field of eleven to win the race with an awesome display of speed. Deputy Minister was back! The following race would confirm this as he won the nine furlong Donn Handicap carrying top weight in 1:48 3/5. However the win came with a price as Deputy Minister suffered a deep foot bruise during the running. This latest set back took him away from the races until July, when he re-appeared in the Tom Fool Stakes at Belmont. The Deputy carrying 126 lbs won impressively by five lengths defeating Fit To Fight and Maudlin, in the rapid time of 1:22 1/5. Deputy Minister was again burdened with high weight (126 lbs) for the Whitney Handicap and was beaten into fourth by a pair of grade one winners in Island Whirl and Sunny’s Halo. He ran unplaced in the Woodward Stakes and then third to A Phenomenon and Fit To Fight in the Vosburgh Stakes. His ankle was carrying heat and he was beginning to show the signs of wear, but Deputy Minister had one more good performance left in him. He was just nabbed at the wire in a photo finish to Slewpy in the ten furlong Meadowlands Cup Handicap. This was to be his last race. Deputy Minister retired to Windfields Farm in Maryland to begin his new career at stud beginning in 1984. Due Process Stable resisted some very tempting offers for the stallion prospect. Since Vice Regent was standing at Windfields in Oshawa, the Windfields management team were very keen to stand that one’s best son at their Maryland farm. Here Deputy Minister shared the stallion barn of his grand sire Northern Dancer, as well as The Minstrel, Halo, Val de l’Orne, Smarten and other top flight stallions. The stage now set for him to become a top tier sire in his own right. Breeders were very high on Deputy Minister from the get go. He had an impressive first book of mares. He proved a very game, fast and genuine race horse on the track and as time would unfold, he was able to pass these traits on to his progeny. Deputy Minister eventually sired ninety stakes winners in his career. The list includes multiple champions and top class sons as sires as well as top daughters as broodmares. In fact he is the broodmare sire of more than one hundred and eighty stakes winners. From his first crop came Silver Deputy. Racing in the colours of Windfields, Silver Deputy won his only two starts as a two year old, which included the Swynford Stakes. The bay colt was forced to retire due to a knee injury. Silver Deputy became a very popular and successful sire of seventy-five stakes winners. His get includes the likes of Archer’s Bay (Queen’s Plate) Silverbullitday (U.S. Hall of Fame), Crown Attorney (King Edward Stakes), Spring At Last (Donn Handicap), Badge Of Silver (San Gabriel Handicap), Atago Taisho (Minyu Cup), and Pool Play (Stephen Foster Handicap). Deputy Minister’s son French Deputy captured the Jerome Handicap and then as a sire he is responsible for Left Bank (Cigar Mile, Vosburgh Stakes, Whitney Handicap) and House Party (Prioress Stakes) in America as well as Admire Jupiter (Tenno Sho Spring) and Kurofune (Japanese Derby, Japan Dirt Cup) in Japan. The latter in the midst of a prominent career at stud in Japan. In addition to his prominent sire ranking in Japan, French Deputy is now among the top broodmare sires in the far east. Other grade/group one winning sons of Deputy Minister include Deputy Commander, a winner of the Travers Stakes and the Super Derby, as well as finishing second to Skip Away in the Breeder’s Cup Classic. Dehere was named the Eclipse Award champion two year old in 1993 after his wins in the grade one Champagne Stakes and Hopeful Stakes. Touch Gold captured the prestigious Belmont Stakes and Haskell Invitational. Victory Speech won the Strub Stakes, Dwyer Stakes, and Swaps Stakes. Always A Classic scored in the grade one Early Time Turf Classic. Go Deputy won the Sword Dancer Handicap and Salt Lake was victorious in the Hopeful Stakes and King’s Bishop Stakes. The most accomplished son of Deputy Minister is Awesome Again. Bred and raced by Adena Springs in Ontario, Awesome Again captured the Queen’s Plate and Jim Dandy Stakes as a three year old. At four he was first across the line in one of the greatest fields ever assembled in the Breeder’s Cup Classic, as well as winning the Whitney Handicap and Stephen Foster Handicap. Awesome Again won all six of his races as a four year old. Awesome Again took up residence at Adena Springs Kentucky division for stud duty where he has become a very successful sire. He is the sire of Ghostzapper (Breeder’s Cup Classic, U.S. 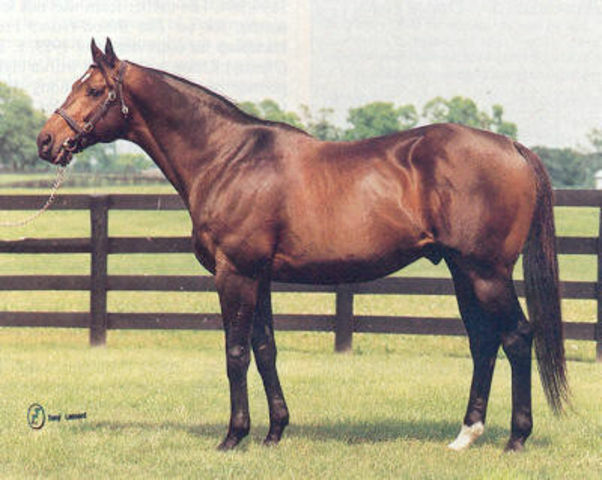 Racing Hall of Fame), who is carrying on the tradition of his sire line with the likes of Shaman Ghost (Queen’s Plate), Judy The Beauty (Breeder’s Cup Filly and Mare Sprint), Better Lucky (Matriarch Stakes, First Lady Stakes), Contested (Acorn Stakes, Test Stakes), and Moreno (Whitney Handicap). Other grade/group one stakes winners sired by Awesome Again are Daaher (Cigar Mile), Awesome Gem (Hollywood Gold Cup), Game On Dude (Santa Anita Handicap three times, Hollywood Gold Cup twice, Awesome Again Stakes, Pacific Classic Stakes), Paynter (Haskell Invitational), Oxbow (Preakness Stakes), Wilko (Breeder’s Cup Juvenile), Toccet (Champagne Stakes, Hollywood Futurity), Dubai Escapade (Ballerina Stakes), Ginger Punch (Breeder’s Cup Distaff, Go For Wand Stakes twice, Ruffian Handicap, Ogden Phipps Handicap, Personal Ensign Stakes), and Round Pond (Breeder’s Cup Distaff, Acorn Stakes). The daughters of Deputy Minister have been, as a group, sensational. Open Mind was the first champion sired by Deputy Minister when she was named the Eclipse Award champion two year old filly in 1988 following her stirring victories in the Breeder’s Cup Juvenile Fillies and the Demoiselle Stakes. She followed up as the champion three year old the next year winning the Kentucky Oaks, CCA Oaks, Mother Goose Stakes, Acorn Stakes, Alabama Stakes and the Pimlico Oaks. Open Mind was elected to the U.S. Racing Hall of Fame in 2011. Go For Wand was a brilliant and beloved champion sired by Deputy Minister. Out of the very good broodmare Obeah, Go For Wand won the Eclipse Award as the champion two year old filly following her exciting win in the Breeder’s Cup Juvenile Fillies in 1989. At three, she would capture her second consecutive Eclipse Award, this time as the champion three year old filly, after her big wins in the Alabama, Ashland, Mother Goose, Maskette and Beldame Stakes. As is widely known by all who follow Thoroughbred racing, Go For Wand tragically died from a horrific accident in the 1990 Breeder’s Cup Distaff. She is buried in the infield at Saratoga, and is visited by many who remember her for her beauty and courage. Further world class daughters of Deputy Minister are Keeper Hill (Kentucky Oaks, Las Virgenes Stakes), Clear Mandate (Shuvee Handicap, Spinster Stakes, John A. Morris Handicap), Hello Seattle (Champion two year old in Canada), Diva’s Debut (Champion older female in Canada), Better Than Honour (Demoiselle Stakes), and Well Chosen (Ashland Stakes). Deputy Minister has made a name for himself as a sire of world class broodmares. He is the dam sire of important stakes winners such as Eclipse Award champion three year old filly Rags To Riches. This beautiful filly won the Las Virgenes Stakes, Santa Anita Oaks and Kentucky Oaks before becoming the first filly to win the Belmont Stakes in one hundred and twelve years. In the Belmont she defeated that season’s Eclipse Award horse of the year in Curlin. Speaking of Curlin, he was out of Sherriff’s Deputy by Deputy Minister. Curlin won the Eclipse Award as the Horse of the Year as a three year old and again as a four year old. Among his biggest victories are the Preakness Stakes, Breeder’s Cup Classic, Jockey Club Gold Cup twice, Dubai World Cup, Woodward Stakes and Stephen Foster Handicap. Curlin was elected to the U.S. Racing Hall of Fame in 2014 and is currently a very fashionable and highly sought after sire standing at Lane’s End Farm in Kentucky. The list of top stakes winners produced by daughters of Deputy Minister also includes additional Belmont Stakes winners Jazil and Sarava, Bob And John (Wood Memorial Stakes), To Honor And Serve (Cigar Mile, Woodward Stakes), Tapizar (Breeder’s Cup Dirt Mile), Frosted (Wood Memorial, Holy Bull Stakes, Remsen Stakes), Man Of Iron (Breeder’s Cup Marathon), Casino Drive (Peter Pan Stakes), Halfbridled (Breeder’s Cup Juvenile Fillies), Dixie Chatter (Norfolk Stakes), and Kane Hekili (Japan Dirt Cup twice, Kawasaki Kinen). Clearly Deputy Minister has had an enormous impact on thoroughbred breeding. He led the North American sire list twice and has also led the North American broodmare sire list. He was a champion on the track and a champion in breeding. He has been one of the strongest grandsons of Northern Dancer to carry on the tail male line. He justified the faith of all who gave him the chance to succeed. His pedigree, while not widely known at the time, did give hints to his chances to succeed as a sire. His fourth dam is Good Example, bred by way back in 1944 by Alfred Vanderbilt. From this mare comes the very good broodmare Exclusive, who in turn is the dam of leading sire Exclusive Native, the sire of Affirmed, Genuine Risk and Outstandingly. Also within the family of Good Example are Versailles Treaty, General Assembly, Cold Comfort, Clover Lane, George Vancouver and Hopeful Answer. Deputy Minister stood at Windfields in Maryland until the 1989 breeding season when he was moved to Fred Seitz’s Brookdale Farm in Versailles Kentucky. Here he would remain until his passing on September 10, 2004, from cancer. Seitz in lamenting the death of the great stallion when he remarked post mortem “He was the best breeding stallion I ever saw. He was a member of the family and a true blessing to this place”. Deputy Minister is buried at Brookdale in a place of prominence. Deputy Minister was the result of all the good that emerged from the depths of Canadian racing’s growing pains in the first half of the twentieth century. Inbred to that era’s top sire and descending from the world class bloodlines developed by E.P. Taylor, Deputy Minister would encapsulate all that both Taylor and the new Canadian turf enthusiasts had begun to develop. That he was bred by a small outfit in Ontario was seen as a major step in broadening the scope of the Canadian Thoroughbred breeding industry. I vividly remember watching Deputy Minister race and saw first hand his speed, class and powerful action. I followed his racing and breeding careers, and admired his accomplishments at both. His son Awesome Again is a personal favourite and I am very glad he is continuing the tail male line. Deputy Minister has left a legacy of class and speed, which is growing around the world. He was a true Canadian legend. Great article Colin. I also remember Deputy Minister too, and I always liked that he was by Vice Regent. Awesome Again is a great sire and I really dig that he is continuing on with Ghostzapper. The Deputy was a great Canadian and a real big influence. Thanks for the walk down memory lane.